Alarm 11: Italy Breaks Up European Terror Cell! MILAN, Italy (AP) ? A Europe-wide sweep disrupted an Islamic cell that was recruiting potential suicide bombers for attacks in Iraq and Afghanistan, Italian police said Tuesday, announcing the arrests of 20 terror suspects. Police said the suspects, mostly Tunisians, were arrested across Europe as part of the sweep against a cell based in the northern Italian region of Lombardy. Executing the arrest warrants, police said they found al-Qaida manuals for making explosives, detonation devices and poisons, and instructions on guerrilla techniques. "Once more, the central role of Milan and Lombardy in the panorama of Islamic militants has been confirmed," the Italian military police said in a statement. The group's members had been indoctrinated in militancy in mosques since at least 1998, according to police transcripts, and appeared to take serious precautions. In one intercepted call, a suspected cell member said that "things are being done with extreme calm, haste does not bring the desired results." Eleven were arrested in the northern Italian cities of Milan, Reggio Emilia, Imperia and Bergamo. Nine others were arrested on warrants issued in France, Britain and Portugal, Italian news agencies reported. 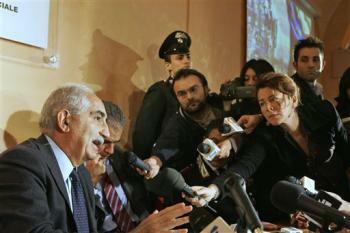 Giuliano Amato, Italy's interior minister, said the suspects are mostly Tunisian. He praised the sting as an example of strong cooperation among European countries. Portuguese police confirmed the arrest of one person there. The suspects were wanted on charges ranging from association with the aim of committing international terrorism to falsifying documents to aid illegal immigrants. Associated Press writer Barry Hatton contributed from Lisbon, Portugal. At least 170 people have died and 500 have been injured as huge explosions tore through three Madrid train stations during the morning rush-hour.